Since Basement Systems, Inc. was started in 1987, we've been upgrading and perfecting our product line to always be the best available. The issue of water in basements has been an ongoing problem since the first basement was built. Sub-floor structures like basements and crawl spaces are not perfect by design and are built on soil that constantly shifts and moves. Water collects around and under basements and can leak in through walls, floor slabs and in between the walls and floors. There are contractors out there that have similar products and solutions to basement water problems. The line of Basement Systems products have been developed, produced, and updated for over 25 years in basements. We know basements! Let our waterproofing professionals give your home a free basement assessment and fix your water problems once and for all. Being in the business as long as we have, there is not a problem we haven't seen and fixed. We serve residents in Quebec City, Montreal, Laval and nearby. Basement waterproofing in Boucherville, Quebec. For over 25 years, the team of researchers at Basement Systems have developed a series of products that are the most proficient on the market today. We took systems and techniques that were adequate and gave them a design overhaul that resulted in the best waterproofing solutions available. By having a FREE consultation with one of our waterproofing technicians, you can build a system that will keep your basement dry...starting today! 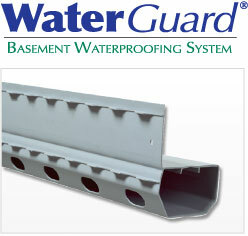 WaterGuard® is a waterproofing drainage system that rests under the floor slab. 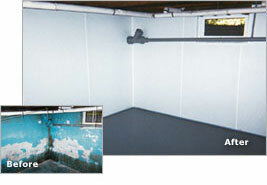 It keeps your basement dry while being clog-free from existing soil and dirt. The openings and the extending flange collect water and carry it away from the foundation walls. By adding a TripleSafe Sump Pump System you can ensure a permanently dry basement. Some basement floors and footings are one solid piece of concrete. These "monolithic" floors cannot be jackhammered to install some systems. For these instances we offer the DryTrak® system that sits on top of the floor and works as a basement drain. We offer a full line of interior basement drainage options designed to keep basements dry. Drainage systems were brought up-to-date with our WaterGuard® drain system. Pump systems are essential to get the water out and away from your basement. 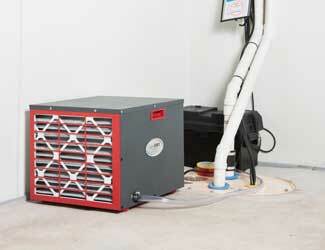 Mold and mildew contribute to indoor air pollution and sickness. Stop it now! Systèmes Sous-sol Québec proudly serves Montreal, Quebec City, Laval, Longueuil, Gatineau, Levis, Sherbrooke, Terre-bonne, Saint-Jean-sur-Richelieu, Trois-Rivieres in Quebec, and all nearby areas. See if you're in the Quebec service area! Q: How satisfied are you with the job we did for you ? A: Very pleased ; Q : What did you think of our installation crew ? A: Efficient and thorough ; Q : How was the experience you had with our office staff ? A: Respectful ; Q : What are your thoughts on our salesman and his presentation ? A: Excellent ; Q : Was the cleanup satisfactory ? A: Completely ; Q : Overall, what were the top one or two reasons you hired us instead of another company ? A: Water infiltration ; Comments : Peter Romaniuk inspired confidence for me to choose your company. His presence on the second work day with the installation crew was important.